Professor Christian Speck and Dr Sarah Schneider have been awarded a £453,833 BBSRC grant for their project ‘The structural basis of replicative helicase loading onto DNA’. The research project utilises cryo-electron microscopy (cryo-EM) techniques and is the first grant for the Speck Lab and the Institute that is entirely focussed on cryo-EM, a technology which is taking the biochemistry world by storm. 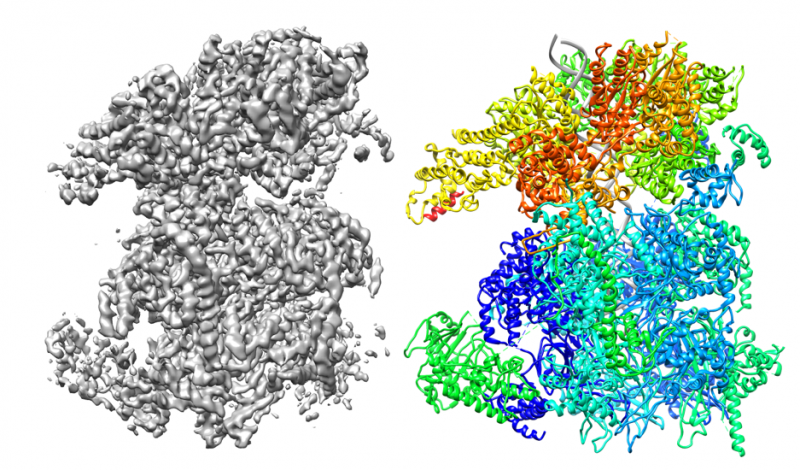 Cryo-electron microscopy came to broader public attention in 2017 when the Nobel prize for Chemistry was awarded to three scientists for its development. It enables the high-resolution structure determination of biomolecules in solution. The scientists behind cryo-EM included an advisor of the Speck lab, Richard Henderson, from our sister institute, MRC Laboratory of Molecular Biology (LMB) in Cambridge. Illustration of resolution and structural information possible through cryo-EM. Image courtesy of the Speck Lab. The technique allows scientists to explore the structure, function and interaction of proteins, nucleic acids and other biomolecules. It provides a new insight into these biomolecules, which previously were unable to be imaged through traditional structural biology approaches, such as crystallography, because of the size, flexibility and heterogeneity of the protein DNA complexes that are studied. The project builds on research from the DNA replication group who are interested in better understanding the pathways and proteins responsible for genome stability. Currently it is not known how human diseases such as cancer and premature ageing could be initiated by defects in the replisome assembly pathway. This 3-year project grant centres around the fundamental understanding of MCM2-7 helicase loading at replication origins, which is central for replisome assembly. The project will help advance research progress in this area, as well as contributing to the understanding of diseases related to helicase loading factors, such as Meier Gorlin Syndrome. Preliminary work from the Speck lab on a modified OCCM (ORC-Cdc6-Cdt1-Mcm), the complex formed between the helicase-loading proteins and Mcm2-7 at the origin and the first step in helicase loading. 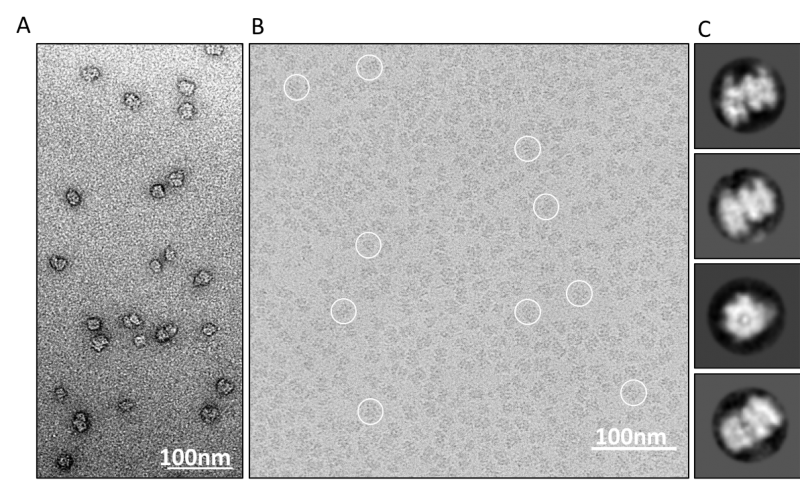 A) Negative stain micrograph depicting OCCM particles B) Representative cryo-EM micrograph C) 2D class averages determined using RELION (REgularised LIkelihood OptimisatioN). Christian was one of the founding members of a London based cryo-EM consortium (LonCEM), which consists of 10 research groups from Imperial College London, Institute of Cancer Research, King’s College London and Queen Mary University of London. In 2017, Christian set up the local cryo-EM facility at LMS including a 200KV FEG cryo-EM that is supported by experienced cryo-EM scientist, Dr Ricardo Aramayo.There is a growing cryo-EM community in London and as part of the new building development the facilities and support structure for cryo-EM at the Institute will be further enhanced.